The Place It is a big void to fill after the departure of Joel Robuchon in Resorts World Sentosa (RWS). The newest fine dining concept which took over the space of the now-defunct Joel Robuchon restaurant is table65, helmed by renowned Dutch Chef Richard van Oostenbrugge. Chef Richard previously ran the two Michelin-starred Bord’Eau restaurant in Amsterdam, before setting up his own restaurant 212 one year ago. The name of table65 takes reference to the numeric identity of 212, except that 65 is also with reference to the country code of Singapore. This is Chef’s Richard’s first overseas foray, which makes me all excited to check out the new restaurant. In terms of interior, there are three parts to the space at table65, the bar, the main dining section which seats 31 diners and a private room. The main dining area does away with the typical fine dining table setting where the layout is instead a 270 degrees counter view of the open kitchen where you can watch the chefs at play in full glory. This lightens the dining atmosphere, and I feel that there is a more direct interaction with the kitchen. The Food The menu is defined by European techniques, though the kitchen strives to use local and seasonal produce where possible. There is currently only set menu available for dinner, at either S$148++ for the 5-course Discovery menu, or S$218++ for the 8-course Experiential Menu. The idea of a fun dining or fine-casual experience is showcased throughout the dinner, where there are periodic visual effects on the plates through the use of light. I had the Experiential Menu, starting with a trio of amuse bouche – the Cold smoked horsemackerel and passion fruit ceviche, coconut and combava, dill and calamansi emulsion; Jelly of tomato consommé with lovage oil and marinated anchovy; Cured mackerel with Quinoa Real, tomato-strawberry vinaigrette and creamy tarragon. The next course is the ‘Os a Moelle’ Veal tartare with smoked herring, bone marrow, cockles and Beluga caviar. This is one of Chef Richard’s signature dishes, where the flavours of the tartare is robust. You don’t get the usual greasiness of bone marrow, but instead the overall flavours blend well together. 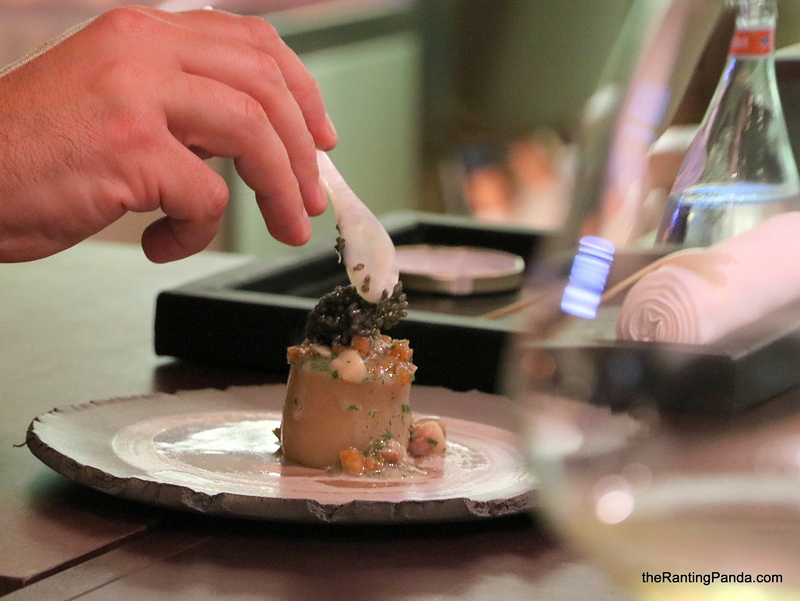 In addition, the Beluga caviar adds to the luxe dimension of the dish. On to the next, I had the Ravioli of Belon oyster with briny veal shank and shellfish veloute, hazelnut and BBQ salted lemon. I am not an oyster fan, but this dish works for me as the Dutch oyster is very creamy and fresh. I can’t discount the delicious hazelnut puree as well, which makes the dish even more endearing. The next course is also a seafood dish, where I had the Mozambique Langoustine. Mozambique is a coastal city in Africa, and is well-known for its fresh seafood. Presented with a foamy look, the langoustine is poached in duck fat and soaked in Albufeira style dashi broth here which has a tinge of foie gras element. Topped with freshly grated coffee beans, the overall taste of the dish is rich, creamy and harmonious despite the various strongly flavoured ingredients. It is a well-balanced dish which I can do with a second serving. The next dish is also a seafood, Turbot with choucroute and black truffle. Heaps of black truffle are shaved into the fish, where it sits on a smoky oxidized wine and eel broth. I really like the smoky aroma and taste of the broth, prepared with chicken and eel. The fish flavour is relatively clean, which contrasts well with the robust flavour of the broth. For a change, the next course is not a seafood dish. It is the Toh Thye San duck, which is binchotan roasted with blueberry aigre-doux, Dutch potatoes and sauce Rouennaise. I first come across Toh Thye San produce at the One-Michelin starred Labyrinth, where I had the roast chicken instead of duck. The Malaysian duck here spots a slightly smoky flavour, along with its tender texture and flavourful profile. While French ducks are conventionally more prevalent in European cuisine, the restaurant stays true to its principle of using regional or local produce where possible. The last savoury dish I had is the coin sized Foie Gras Kombu-jime poached in broth of seaweed and umeboshi. I personally enjoy foie gras, but it is probably the first time I had it in a Japanese inspired broth. For desserts, there are two courses. The first is one of the signatures from the Michelin starred Bord’eau, aptly coined the Apple. The presentation resembles a green apple, except that this is encased in a glass bubble made of sugar. The way to eat it is to smack through the glass, and have it along with the green apple sorbet. The middle of the apple is chocolate ‘pips’, while the base is a puff pastry base. This dessert though, is just a prelude for the next dessert. The second dessert is a choice from three options, where we opted for the Balloon. The Balloon is my favourite here, and it should rightfully be for any self-professed chocoholic. A mini chocolate sphere is presented, before a dark chocolate sauce is poured over it and keep your eyes open at this juncture. The sphere splits beautifully to reveal the chocolate ice cream within, akin to a blossoming flower. It is very rich, but the intense and dark chocolate flavour really grew on me. Rants While counter seats are fun to watch the kitchen in action, the restaurant setting (other than the one private room) is pretty open concept. If you fancy a more intimate dining ambience, this may not be the best spot. Will I Return Again? I enjoy the dishes at table65 overall as it come across as robust and strong in flavour. The plating and presentation of the dishes are on point, while service is professional and engaging. Other than table65, there are the likes of Curate and Teppan by Chef Yonemura in close proximity which competes in the same price range. That said, this may very well be the best restaurant at RWS at the moment for me, and if the stars align, it may emerge in the next Michelin series.